Elizabeth is an award-winning Interior Designer and Project Director with 14 years of experience. Her strength stems from working in a variety of positions within intereior design firms in Bangkok, Baku and Dubai as well a s having her own design studio i London. With a background in fine art, Valkovics' designs began with a traditional approach, hand skecthing and gathering inspiration from various influences whether it is theatre, music, fashion, or art. Her versatility can be seen in her roles in design, business relations and project management, and her desire to maintain a hands-on approach, working with clients and consultants to achieve final designs of an exceptionally high quality. 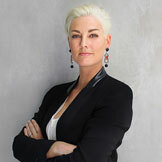 Elizabeth was Head of Interior Design at Edge Design in Dubai and has since moved on and appointed Design Director for Design World Partnership.